Barely more than ten years after Johann Sebastian Bach´s death and only a few years after Georg Friedrich Handel died, the child prodigy Wolfgang Amadeus Mozart took to the musical stage, probably for the first time during an artistic outing in Munich in 1762. 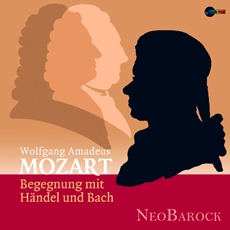 The programm on this CD unites a number of chamber music works connected to the names of Mozart, Handel and Bach. The focal point of the recording is Mozart´s three short harpsichord concertos KV 107/I-III based on keyboard sonatas by Johann Christian Bach. Between these works are placed pieces by Handel, Johann Sebastian and Carl Philipp Emanuel Bach. Gripping and explosive interpretations which combine passionate and lively playing with perfection and virtuosity; this is NEOBAROCK`s trademark, an ensemble which formed in 2003.